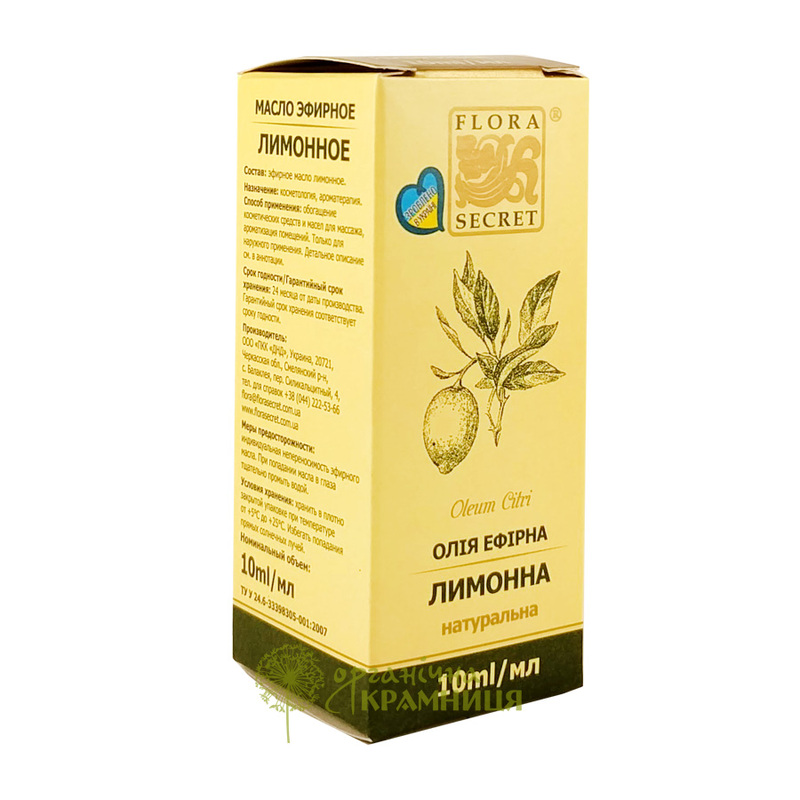 Lemon essential oil is produced by the Ukrainian brand Flora Secret. The oil has a fresh, cold, slightly bitter scent. It provides a psycho-emotional, therapeutic and cosmetic effect. Lemon oil can be added to cosmetic products or used in aromatherapy. Lemon essential oil has a wide range of useful properties. It can be used to combat respiratory infections, increase mental performance, and get rid of cellulite, corns or warts. Lemon oil is obtained by cold pressing or steam distillation from the peel of unripe lemons. This oil can be combined with other essential oils such as orange oil, bergamot oil, grapefruit oil, tangerine oil, petitgrain oil, basil oil, coriander oil, thyme oil, tea tree oil, clary sage oil, cypress oil, geranium oil, lavender oil, peppermint oil, rosemary oil, marjoram oil, pine oil, fennel oil, oregano oil, ginger oil, jasmine oil, neroli oil, patchouli oil, rose oil, and parsley oil. Psycho-emotional effect. Lemon essential oil gives a mood boost and relieves stress and anxiety. It also helps to recover after a hard day and reduces sensitivity to weather. Therapeutic effect. Lemon oil has an antiviral and antiseptic effect. It helps to boost the immune system, relieves headache and nausea, strengthens blood vessel walls, and reduces fever. Lemon oil can be used an additional treatment for respiratory infections and sore throat. Cosmetic effect. The oil has a strong toning, whitening and anti-cellulite effect. It helps to prevent brittle nails, prevents hair loss, stimulates hair growth, prevents dandruff and normalises sebum secretion. The oil can be used to treat rosacea and hyperpigmentation, improve complexion and eliminate freckles. Ingredients. Citrus Limon (Lemon) Essential Oil. Want to buy Lemon Essential Oil? Call us or submit your order via our web site!